Hi everyone, it's Friday, so it's a great day, but than again, every day is a great day, right???? Since Thanksgiving is so close, I have two Thanksgiving cards to share with you. The first one I made with Samantha Walker's Fall Family Memories Unity Stamp set. I have to say, I have been having so much fun with this set, and I have made quite a few cards with it, but I think this one is my favorite so far. I sure hop you like it, too. This was one of the 13 Thanksgiving cards I had to make for Michael, there were other designs, too and will share them later on, but for now, this is one of them. Papers are all by My Minds Eye and I know it's not your typical Thanksgiving color palette, but I really love it, regardless....so what do you think? 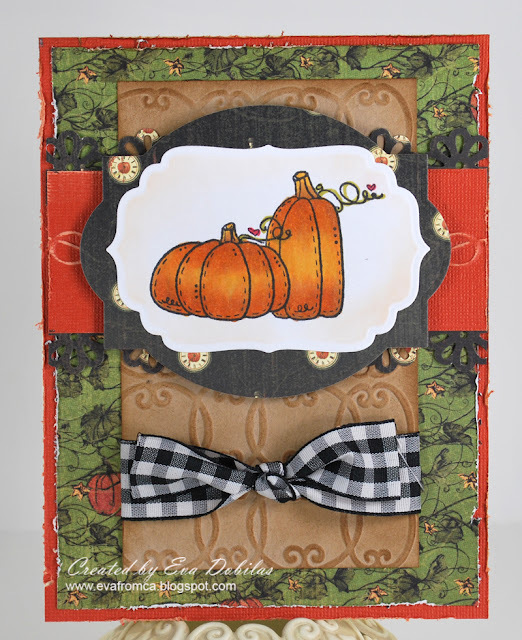 I also used my Spellbinders Eyelet Square label, which I love and just fit the stamps so well. My second Thanksgiving card was made with the October Unity KOM and the image of course was just perfect for it. Now this is more of a Thanksgiving palette, isn't it???? I used Graphic 45 papers for this and Scrap-mart's Exclusive OvalSquare Spellbinders label and Spellbinders Label Four...so love these shapes! Well, that is it for today...Hope you have a fabulous Friday!